Manage student fee collection and receipting with greater ease! Never handwrite another receipt with our student management system. Getting a hand cramp from writing all of those receipts? And how many times have you thrown files around looking for a loose slip of paper? There's got to be an easier way��.and in fact, there is. Active Network's industry-leading student management system, Tracks?, automates student fee collection and offers a web store and point of sale integration. You finally have the tools you need to easily manage student fee collection and receipting. 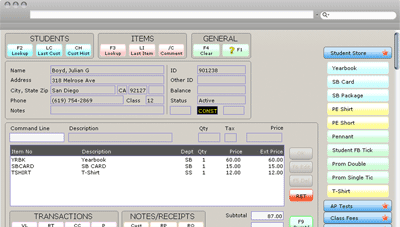 Active's student management system incorporates bar code technology and a smart Work Screen so that transactions and receipts take just seconds. Student payments can be made online and as each transaction is completed, the system tracks which items are sold and to whom. Your inventory levels are instantly updated while each student's purchase history is automatically logged. If students have existing debts, you'll be able to view those balances and follow up on collection. In other words, you have all the information you need, all in one place. With Active's student fee collection software, you get an easy, quick and integrated system that will save you a significant amount of time and effort. Tracks is my lifesaver. Tracks helps me multi-task as we sell everything from prom tickets and PE clothes to AP tests and lockers. It has everything you could ever want and I can pull up a report in a heartbeat. With Tracks, I get updated sales reports, track student fees and donations and with its automated receipting process I have eliminated my shoe box full of receipts. Tracks has truly changed my life!